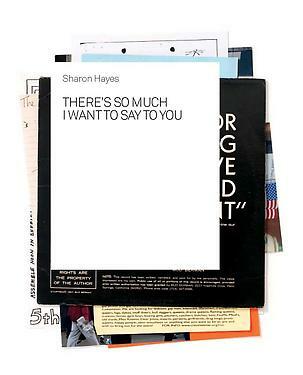 In her performances, videos, and installations, Sharon Hayes (b. 1970) explores the nexus between politics, history, speech, and desire. Her works modify or appropriate the language and tools of political dissent, creating unexpected affinities between important historical events and the present. Highlighted in this volume is the video installation Symbionese Liberation Army (SLA) Screeds #13, 16, 20 & 29 (2003)—a work in which Hayes memorized the famous taped speeches by Patty Hearst and her kidnappers, the leftist radical group the Symbionese Liberation Army, and then reads them to an audience who corrects her mistakes. It is in these slippages between memory and history that the meaning of Hayes's work resides. This book also includes a group of new site-specific works that addresses the Whitney's role in the historic development of process-based, performative art and its engagement with politics that took place in the late 1960s and early 1970s. This book serves as document of Hayes’s thinking process, featuring original contributions from Hayes and some two-dozen other writers, artists, and activists, which provide insight into the motivations and development of her projects. The catalogue includes images carefully selected by the artist—photographs, vinyl LP covers, fliers, images of Hayes’s own work—and a short text response by each of the contributors. Contributors include: Dennis Adams, Lauren Berlant, Saramina Berman, Claire Bishop, Juli Carson, Kabir Carter, Christhian Diaz, Saeed Taji Farouky, Malik Gaines, Andrea Geyer, Leah Gilliam, Michela Griffo, Sharon Hayes, Holly Hughes, Chrissie Iles, Iman Issa, Hans Kuzmich, Cristobal Lehyt, Ralph Lemon, Brooke O’Harra, Jenni Olson, Dean Spade, Lynne Tillman, What, How & For Whom/WHW, Craig Willse.